Here at Peppermint, we are first and foremost an events solutions business. However, many people are unaware that we have a fantastic creative team behind us, ensuring that our brands are presented in the best way possible for their individual target audiences. Working as a team, we create a synergy between linear and creative minds to achieve first-class results. Here is an example of just that; our upcycled bar project with London’s up-and-coming masters of mixology, Tails Cocktails. From start to finish, we implemented everything from the designing, engineering, delivery, and the installation. Falling during the first week of October, London Cocktail Week is a vibrant celebration of London’s tremendous cocktail scene, situated at The Old Truman Brewery; a hub of creativity for new and innovative businesses. 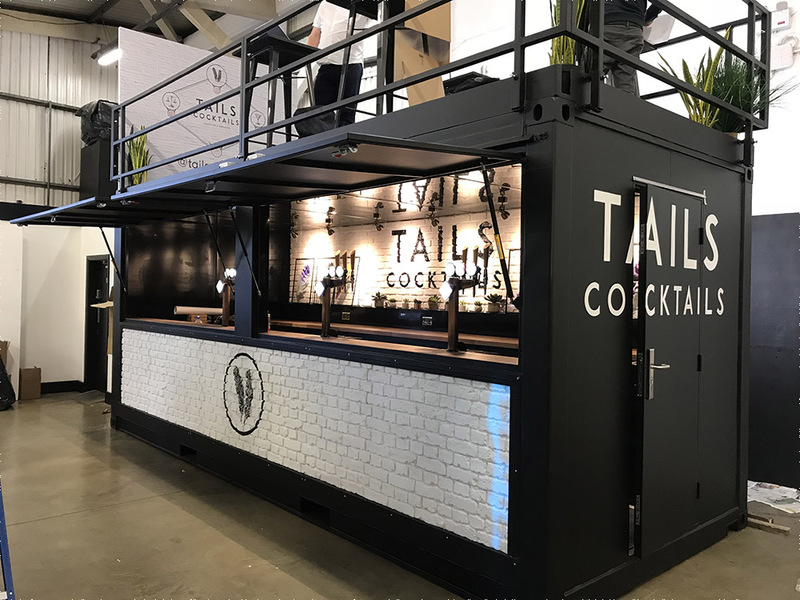 Following Tails’ wishes to appear at this high profile event, we were given a brief to create, build and install a bar that met all of their requirements in a short 4-week timeframe. Robin, our Production Director, headed up the full end-to-end project and was the brains behind the upcycling idea. Aside from its environmental benefits, there is something so satisfying about transforming something old and tired into something shiny and new. Previously bright red, worn and sprouting a tree out of its roof, was an old branded bar container that lay dormant in our yard. It was re-engineered to become super-functional, acquire draft technology and resemble London’s trendy cocktail scene. We gave it a good lick of paint, an exposed white brick wall to the front, and added a roof terrace, for a premium, VIP customer experience; something vital to staying relevant in the retail market today. Now, it is hardly recognisable! 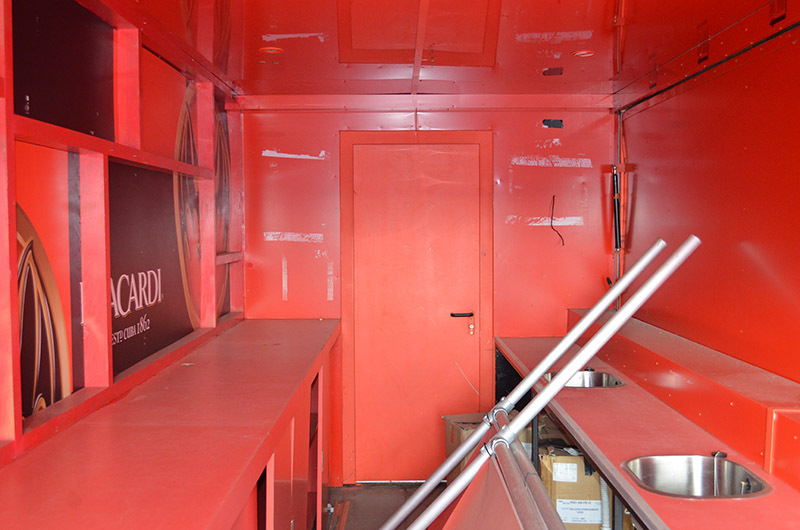 Patrick, our Operations Manager, ensured that the very complicated installation of the bar ran smoothly. Delivering it was no mean feat when it meant having to push the container by hand into the exhibition hall in the very early hours of the morning. 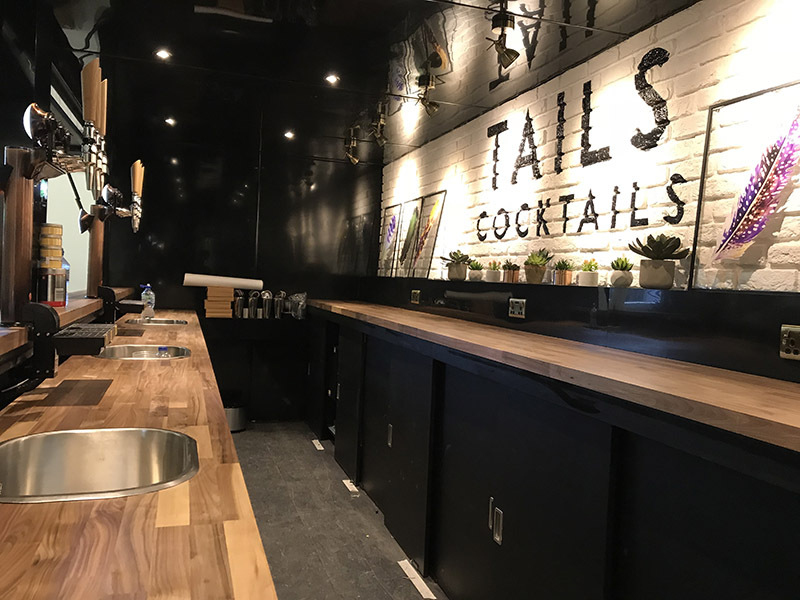 Now, it’s Tails’ very own bar to ‘pop-up’ wherever they like. To top it all off, we provided a fantastic team to work within its walls. The hard work was absolutely worth it, and was considered by our Founders Adam and Alex as, “One of the best projects of the last 12 months”. The process has been an immensely exciting and rewarding experience for our team at Peppermint and has proved that our business is capable of excelling in every aspect of the events industry. The feedback on the container has been insanely positive. Robin and the team have done an awesome job! Quick question..do you have an EPOS till and software partner for your bars? I’m really interesting about the concept of the bar where I can buy one like this?